Chicken enchiladas aren't something you really ever find on a Tex-Mex menu in the UK. If you do see them it's going to be some variation of the idea, but never a complete picture of the real thing. If I was going to stick true to my mom's recipe I'd only be able to follow the exact recipe whenever I came across an American product called 'rotel'. Rotel is a brand of canned tomatoes and green chillies. Slightly spicy, and mostly used in Mexican and Tex-Mex dishes. It's particularly good in queso but of course I never have it. For any expats reading this, I have basically found a really easy way to make it. I drain a can of chopped tinned tomatoes, and roast two green peppers and a green chilli. After it's roasted for about 40 minutes in a 200C oven, I wrap the chillies and peppers in cling film until it becomes room temperature, then remove the cling film and the skin of the chillies and peppers just peel off. I take out the seeds of the green pepper, and reserve the seeds on the chilli to make it as hot as I'd like. Then mix it with the drained tomatoes. Voila! Instant Rotel. The good thing about it is you can make it as hot or mild as you want. Anyways, this is what you need for the chicken enchiladas recipe that I'm making of my mom's. Sometimes if can get to Coolchile.co.uk in the right season, they sell poblano peppers which are infinitely better in flavour when compared to green peppers. But since those are hard to come by, this is a really easy short cut to the recipe. And oh yea, I forgot to mention the other difficult part to this recipe. Corn Tortillas. 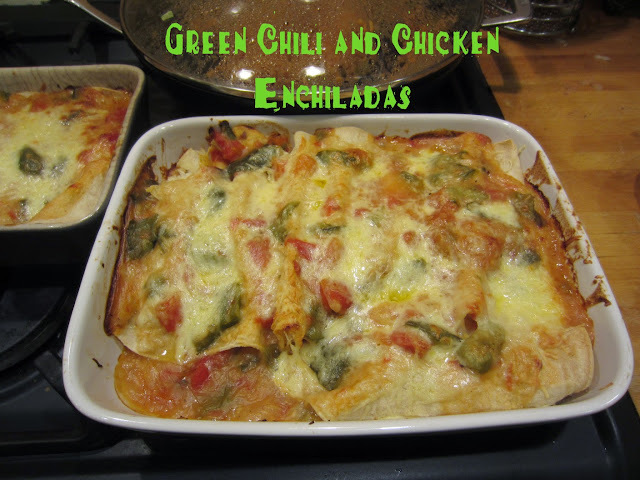 Never in the UK have I ever tried to make enchiladas with the crap that Old El Paso tries to sell as corn tortillas. I have to order mine at about £2.50 a dozen from CoolChile.co.uk. Fair enough because they're the exact right kind I need for this recipe. I have linked to the exact ones I use for reference. They have a 'bakers dozen' I believe which is 13, so I that's what these make 13 fat enchiladas. Adjust as you like, but these are pretty authentic to my moms. On another note, I usually do everything in advance and then just assemble on the day. Boil the chicken and debone. Of course you can use pre deboned chicken, you'll need about 500grams. I boil mine with onion, pepper, garlic and salt. Roast the bell pepper and chilli for 40minutes at 200C, wrap in clingfilm and wait till room temp. Grate the onion in a food processor. Grate the cheese on the fine setting, put in the fridge if not using immediately. For the sauce, melt the butter in a saucepan then add in the flour, and stir continuously for about five minutes to cook off the flour. Next take off the skin on the green pepper and remove any seeds (see instructions in paragraph), and chop finely. Stir into the butter and flour mixture until coated. Slowly add in the stock 250mls at a time, and add more when it boils thick. Add stock slowly and simmer until you get a thick sauce that covers the back of the spoon. You might need slightly less than 750ml, so eyeball it. Spoon about a quarter to half a cup of sauce onto the bottom of the casserole dish and spread around so the enchiladas don't stick. Get your assembly station set up, cheese, grated onion, and chicken all in a row. Microwave tortillas 5 at a time for about 30-45 seconds until soft. ***Make sure you leave about a third of the cheese for the top at the end. Pour over the sauce, (if you're using two dishes, make sure to appropriate enough for both), then next with the remaining cheese. Bake at 180C for about 40 minutes uncovered for 5 more. Serve with rice, salad, and pinto beans. G&G Garden Services in Bexleyheath Repaired My fence! Greetings readers. As you know my blog is primarily devoted to food but sometimes I have to go out of my way to give a review to a deserving company or service. Today I'm talking about a G&G Garden Services in Bexleyheath. Not being from the UK, and especially living out in the suburbs for the first time, it can be quite daunting to find services to fit your needs that provide value and quality service. We moved into Bexley just over two years ago, and from the start there was a lot of gardening issues that needed to be addressed. The first thing we chose to do was have some Eucalyptus trees felled that were completely out of control. With the winds we get here, it's often dangerous to have trees grow so high. Not knowing who to use I just searched 'garden services Bexley' (the Borough we live in) and a few came up, including G&G. I contacted G&G via email and a price and date was discussed. On the day they turned up and in a matter of about an hour the two 60ft eucalyptus trees were gone, roots and all. Extremely happy with the services provided. Two years later the fence was in serious disrepair, including a massive shed that was left behind that was full of rubbish and also added to by us including wardrobes and another old shed that we brought when we moved in etc etc! Lots of junk. Originally we thought we'd get a hire a skip to get rid of the junk and decided to look over some garden services that could perhaps suit all of our needs in one go. When I started to look through services in the area, G&G came up again, with all the services I needed. What impressed me most about their website was the photos of previous work and jobs they had done. In this day in age we focus primarily on visuals, and it's really difficult for me to go to a company without a properly working website, and photos to parade their work. I contacted Grant through text, but ended up querying on a form on their website which suited me better, and them I'm sure. I found them responsive and engaging, and they called me within two days discussing a date they could come out and price out the job and give me an idea of what was going on. They told me it would be a few weeks but it ended up only being a little over one week that transpired between first initial quote, and the start date. Fantastic. Back part of the fence, with hideous shed and wonky corner post. Rubble behind the wonky shed. G&G working hard to get rid of that hideous shed, look at the horrible fence behind it! All done and completed look from the back end! Love the space now w/o the shed! Bulge in the corner, and wonky fence post. The entire back corner, was in disrepair. Removed the old panels, getting ready for the fresh wood! G&G fitting in the new gravel boards. Really impressed at how well this looks! That fence post is straight now, they dug it up and poured concrete in the proper way to repair it. This was before the back panel was done. Still looks great! This is one of the last photos I have that's visible without being behind big trees, or blocked by our other shed. Overall, I'm really happy with the work. There was one panel that was a little bit wonky, just a mistake in the building of it I imagine, but not a problem, I called them up and they were happy to sort it out. That's the kind of workers I want in my house. So if you're thinking about having them out for something I definitely would recommend them for anything! Stew and soup are one of the few things that are on my favourites list of food to make. However DH absolutely loves them so from time to time I indulge him and make him something. I wanted to make something that resembled something for St. Patricks day although I totally get that this is definitely something that really only Americans indulge in. What I've learned from living in the UK, is that there are the four countries within the United Kingdom that celebrate their own patron saint on different days of the year. In England there is St George on April 23. In Scotland it is St. Andrew on November 30, and in Wales there's St David on March 1. The only one that that anyone actually remembers, myself included is March 17, which is St. Patricks day which everyone remembers from having to wear a bit of green at school or else you were pinched. That is probably such an American tradition that has fallen on deaf eyes/ears here in the UK. While I'm sure there are some Irish festivities going on, I barely hear a peep. With that said and enough of my really crap history lesson, I'm going to get on with my recipe that just happens to use Guinness in my weak attempt to pay my homage to the Saint. 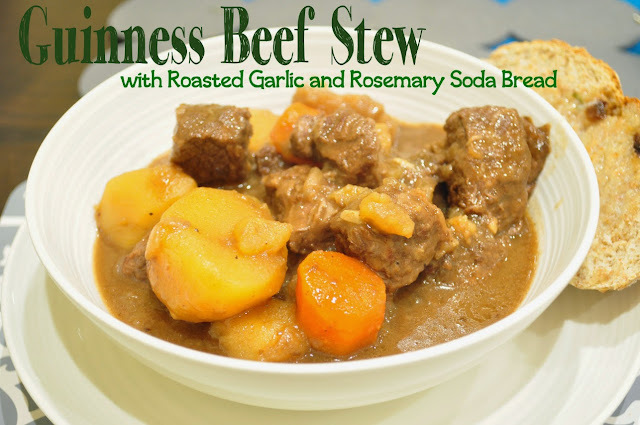 Like I said, I don't really like stew, but I do like a bit of Guinness, and there's nothing more Irish than Guinness and beef. This was incredibly easy as I cooked it in a slow cooker so it does all the work for you. There's a little bit of prep but once that is finished there's not much left to do other than sit and leave it to cook. You could absolutely do this in a cast iron cassarole dish and set it in the oven to forget but I'd much rather forget it in the slow cooker, I'm pretty sure it uses less electricity. I fully recommend getting yourself a higher welfare piece of meat. In my opinion it's just not worth it to eat meat unless you're giving the animal a piece of what it deserves, a better life and a better slaughter. Ok off my soap box. And to the recipe...this recipe will serve at least 6 and stretched to 8 if you have some extra sides and more bread. OH THE BREAD.. I almost forgot. So I decided to use a traditional BBC Recipe for soda bread by James Martin, but I wanted to add some roasted garlic and rosemary to just give it some extra flavour. The recipe is as follows exactly from the BBC Website with my additions. Enjoy! Perfect for dippin' some bread in! Cut the meat in large chunks if not already, toss in salt pepper, and then in half of the flour to coat completely. In a large skillet heat the oil and then toss in the meat to brown on each side. Begin to peel the carrots, turnip and parsnip and cut up the onion in chunks. Add all of the vegetables including garlic to the browning meat, and turn up the fire to full wack. Add in the can of Guinness and bring to a rolling boil for 5 minutes. Next add in the stock and bring to a boil. Transfer to a crock pot on high heat for about 4hrs. At the end of four hours, go ahead and add the remaining 50g of flour with a little stock or water until it forms a thick paste, trickle in teaspoon at a time until the desired consistancy of stew is achieved. roast a whole head of garlic chopped in half drizzled with olive oil wrapped in tin foil for about 45 minutes at 200C. When you're ready for the bread heat the oven to 200C. Stir together flours, salt and bicarb soda in a large mixing bowl and mix well. Next squeeze out the roasted garlic which is like a paste into the flour as well as the rosemary. Next pour in all the buttermilk and mixuntil a soft dough is formed. Shape into a round ball and cut a cross on top and place on a lightly floured surface and bake for about 30 minutes or until hollow sound inside. One of the things I miss the most from the states is American style Italian sausage. 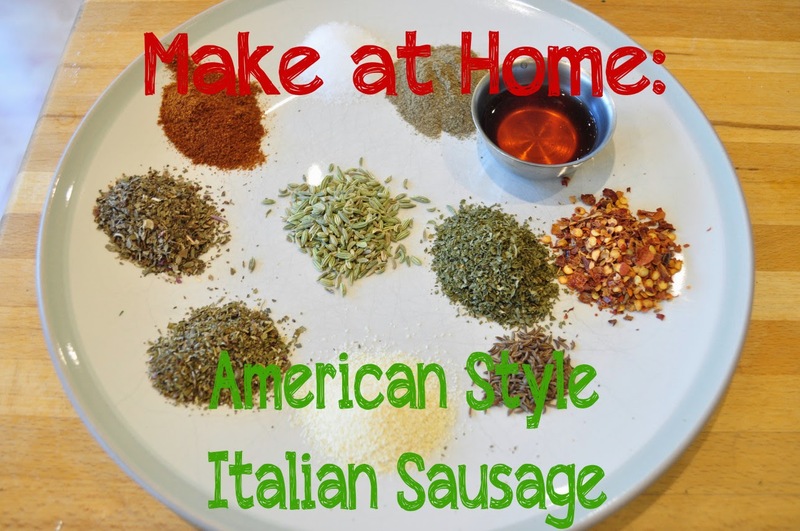 It might seem like such a oxymoron “American/Italian” sausage...but it's legit trust me. Thet hing is, this sausage is pretty much stricty an American thing, and I'm guessing it's adapted from the huge Italian culture in the north eastern United States. Either way, it's darn good and it's everywhere. It's fantastic because they put it in casings and you can grill it, or squeeze it out in your marinara, or lasagne. Really nice stuff. The point is they have nothing like it here in the UK and I've been missing out on it. I decided to look through many recipes. Back home they have a sweet and a spicy kind and I opted to make mine the spicy kind. If you want to make it sweeter just add 1 tsp. Of brown sugar to the spice blend and get to mixin'. I used 500g of lean minced pork meat, which is about 1lb. You can double this easily too. I decided to make some meatballs for mine to go in a calzone (recipe to come), and then I froze the rest for later. The recipe makes about 10 meatballs, or would make a perfect bolognese for 4. Enjoy. Mix all the spices and red wine vinegar with the pork mince and mix thoroughly with your clean hands for about 10 minutes until thoroughly combined. Ok, so there's nothing gourmet about this dish. It's just a simple craving that I had and I know that this isn't even close to the real thing. Sometimes you just want junk on a Friday don't you? Back hom we have 'Taco Bell', I have't really been there in probably 10 years or so but sometimes I get a hankering for the idea of things. For this it was their 'Mexican Pizza', simply put a few tortillas with beans, grouned beef, some spices and cheese. I'm sure that this is utter garbage and will make your stomach churn with discomfort at the thought of the calories and nutrirtional value but I decided to do my own take on it. Obviously taking inspirations from all places sometimes leads to really good ideas! Anyways, back to the recipe. For me, I decided to go with chicken on this one, and decided to take inspiration from my mom's chicken tacos, which I remember as a kid and really miss the flavour. I'm sure I can't recreate it near as good as I'm lacking in most of the spices, but you boil the chicken until well done, let it cool, debone it and then refry it with a bit of the water it poached in and some spices. Probably not the easiest dish I've ever made on a Friday as it was a bit time consuming with the chicken but if you wanted to do something else that's easier, like mince beef, or even precooked chicken that you buy, anything will work. I also mashed my own beans which makes a bit more work but I enjoy it anyways. 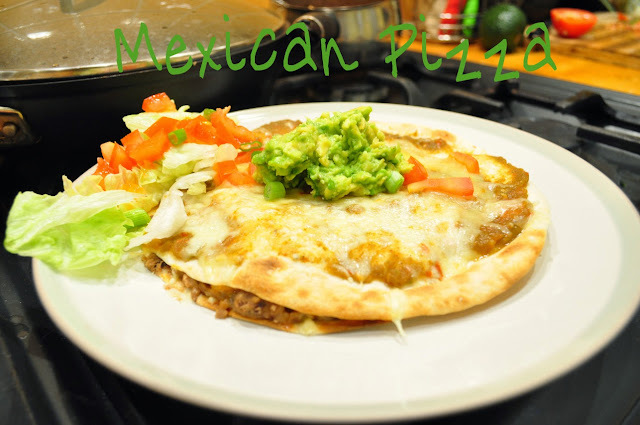 So here's my Mexican Pizza as inspiration for a plethora of any other ideas you might have. 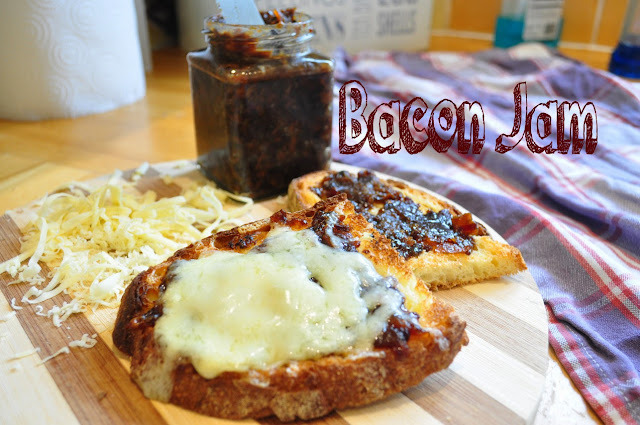 This recipe serves two but could easily be made to suit your needs. I started by boiling the chicken for about 45 minutes with onions, garlic salt and lots of pepper. Take it out and cool it for about 30 minutes before deboning. While all this is going on, open a tin of beans and drain until almost all the liquid is out. Place in a small sauce pan and turn the heat on high and mash with a masher, adding the cumin and 1 tbsp of chilli powder. You can add small spoonfuls of the chicken stock water if it gets too dry. If there is too much liquid just continue to slowly boil it off. Cook these until a nice creamy consistancy and then turn off the heat. For the chicken, when deboned place in a pan with a little bit of the broth, a freshly chopped onion and garlic and 1 tbsp of chilli powder. Boil on high for about 10 minutes continuously adding the broth to keep the chicken hydrated. Fire up the grill to full blast and line a baking tray with foil. Place the tortillas under the grill for a few seconds to get heated through. Spread the bean mixture over the tortillas. Next pile on the chicken and cheese and put under the grill for a few minutes or until cheese is melted. Finish with scallions, salad, guacamole and sour cream. 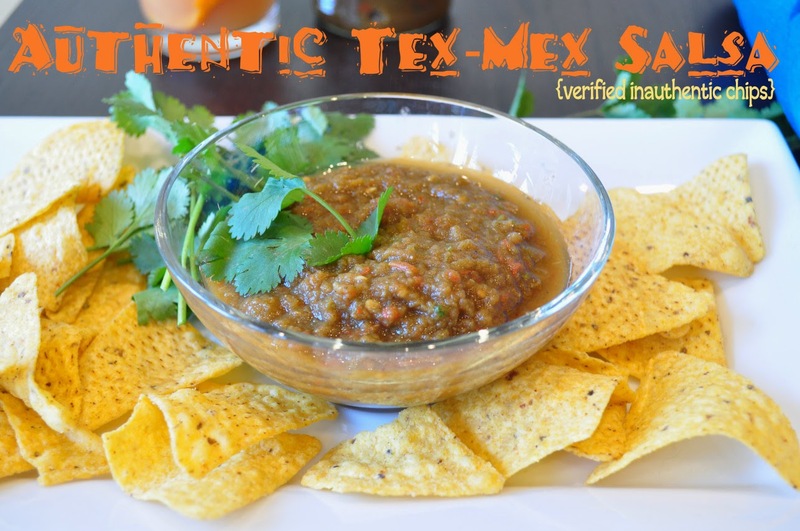 So the thing with salsa is, everyone and their mom has their own recipe to calltheir own. I am no different from this. In fact, almost every time I make salsa, it ends up being a different variation of this recipe. Simply because salsa is something you make with what you have. Sometimes you might not have fresh coriander, or sometimes you're out of fresh tomatoes and want to use a tin. I don't care what way I make it as long as I have some on my breakfast tacos. Oh yea, breakfast tacos, that's something that Brits will never get. Breakfast tacos are a thing, call it a wrap, call it a burrito, but get on this. It will change your life after you scramble up some eggs with bacon or potato and throw it in a tortilla and shove it in your gob, with some salsa of course. The possibilities are endless with salsa. Anyways, I love salsa. Lets get on to the recipe. *Disclaimer –I can not verify these chips. They're Doritos lightly salted, which back home would be an absolute travesty to use with chips and salsa, but being in the UK Doesn't afford me much luxuries in the corn tortilla department. This is also something we need to get on as a nation. #soapbox over. Delicious with chips and a margarita! First chop up the chillies, pepper, garlic, onions and half the coriander. Put in a saucepan to boil with about 300ml of water. Add some salt and the pepper. Bring to a boil and boil vigorously until the pepper has faded from bright green to dark green or the water is evaporated by more than half. Chop up the tomatoes into big chunks and boil them for about 5 minutes until soft. Then set aside, to cool for about 20 minutes. Use a hand blender to blend it up into a nice runny consistancy. You can leave it chunky but for purposes of being authentic we want a nice watery texture. Check for seasoning and serve with some chips and drink my pineapple cocktail! *Note - depending on your ingredients, this salsa will come out more red or more green, or sometimes if you use tinned tomatoes it will be a lot thicker. I really like meatballs. They're super easy to make and really good to take to a party for appetisers and best of all they're really cheap. You can throw just about anything into some mince meat and come up with some pretty fantastic combinations! I happened to have some pork mince and some Thai style ingredients leftover from a green curry that I made and I wanted to experiment! I also put together a little BBQ style sticky glaze to go on top which was really yummy and tasty. I glazed the meatballs at the last five minutes of cooking and then used the rest as a dipping sauce and it was really delicious. It's really easy to make meatballs in the oven in muffin tins. Just spray a bit of nonstick spray and toss em in! It's a nice trick instead of frying them in a pan with lots of oil. Just let them cool completely before you scrape them out! The glaze that I made to go over them would go with a wide variety of things including chicken wings and BBQ ribs with an Asian flare. 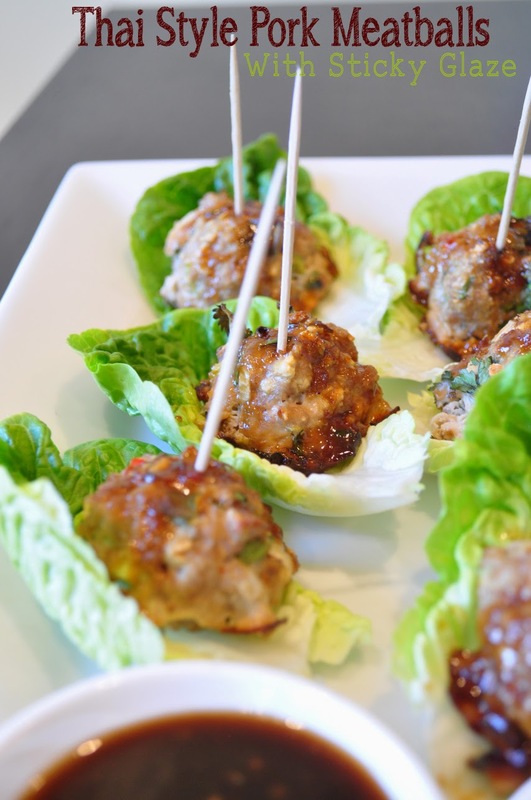 This recipe makes about 15 meatballs, but obviously can be doubled and trippled! Enjoy! Get your ginger grated, chop the coriander, chilli, green onions and garlic. Mix the pork with all of the ingredients and mix thoroughly. Spray a muffin tin with nonstick spray, and roll the mixture into balls and place in there. Then glaze and cook an additional 5 minutes. While the balls are cooking in the oven, mix all of the ingredients together in a small saucepan and bring to a boil. Turn down and simmer for about 5 minutes. Next turn off heat and use for the glaze or dipping. They make great party food!